“Jungr overflows with intensity, she’s a fireball, a force to be reckoned with and with good reason, since she’s unafraid to sing with such heart-jangling and white-hot emotion she appears at times to be hanging by a thread on the brink of madness. Ageists beware, for Jungr, maybe a self-deprecating clown spewing ad-libbed, funny jokes, but, it takes masses of courage, experience, verve and yes a great deal of hide to cover landmark anthems by two of the greatest living male American singer-songwriters. Her voice is expressive with a big range, and she injects masses of colour, pathos, power and moments of surprise to the items in her song list – which includes ‘Everybody Knows,’ ‘Land of Berlin,’ and a ‘1000 Kisses Deep’ – along the way. “You don’t have to be a devotee of either Bob Dylan or Leonard Cohen to appreciate the respect and admiration for their work that Barb Jungr brings to her remarkable exploration of their songs. Jungr’s is certainly not a sycophantic fan’s view, but an insightful, forensic examination into what was in the composer’s minds as they wrote the songs. 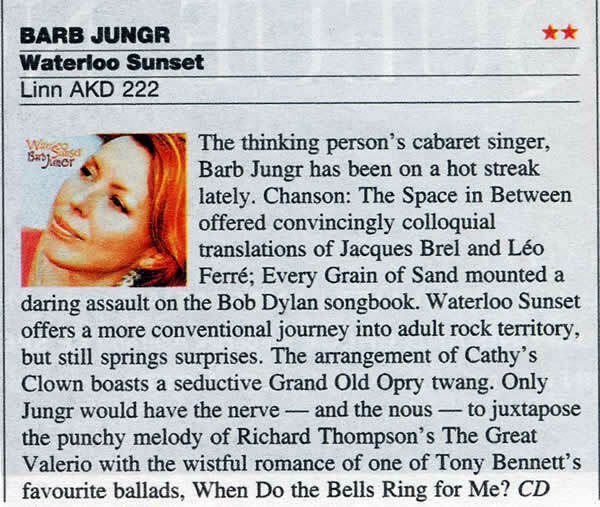 “Barb Jungr does not disappoint. Her stated aim is to present ‘P’ songs: philosophical and political – but she does so with an impish persona that is delightful. It’s All Right, Ma’ one heck of an opener, a reminder of why Bob Dylan is regarded as a poet of popular song; Jungr’s movements here are unselfconscious and joyful, her enthusiasm contagious. Much of the program is not as upbeat as this, though most of it is gripping and rewarding, even galvanizing at times. Her grainy voice and its jazzy phrasing, not to mention an exceptional accompanying pianist in Mark Fitzgibbon, provided a fine afternoon of music. “it’s as if Edith Piaf and Nick Cave had a love-child, who was adopted by Carmen McRae.” This show is a master-class in cabaret, in singing and in the art of reaching an audience. Judging by the queue of adoring fans in the foyer afterwards, Adelaide will call Jungr back for more. I, for one, will be there. Barb Jungr’s dynamic and powerful performance highlights the poetry, philosophy and perplexity of Bob Dylan and Leonard Cohen. Her unique interpretations and arrangements breathe new life into some modern classics. Jungr has the knack of being able to tell amusing anecdotes and jokes just before performing a powerful song intensely. There are times when she energetically uses the stage and others where she maintains perfect stillness to good effect. Never have I witnessed the words of Dylan’s “Masters of War” sung and enacted with such fire and commitment, and the imagery of the warmongers’ deaths and burials made manifest so simply and effectively. …all politicians could see Jungr’s version of Cohen’s “The Land of Plenty”: it was a stunning moment of dramatic, soulful singing. If only the world could respond to his words. 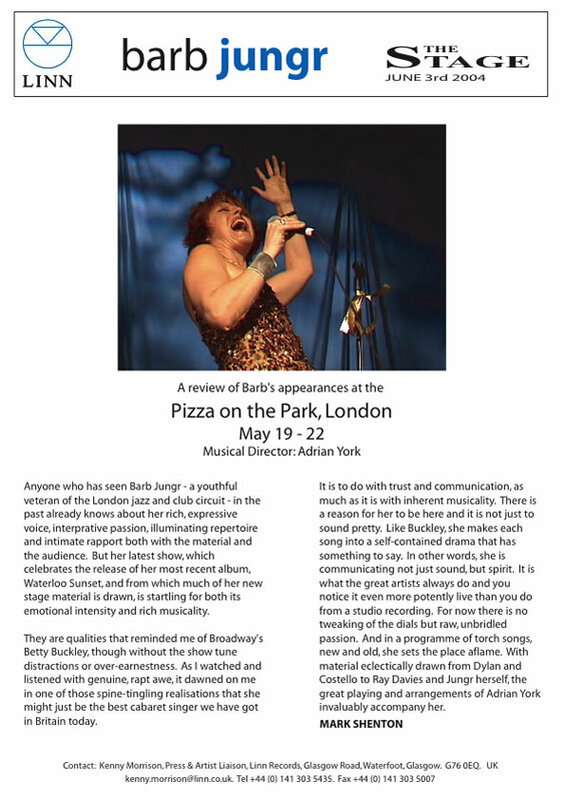 Hard Rain is what you would expect: the poetry, philosophy and perplexity of Bob Dylan and Leonard Cohen presented in a dynamic, heartfelt manner that had the audience enthralled and desperate for more. “She fearlessly tackles tunes that are pretty amazing in the first place and invests them, if it’s possible, with even more drama. Add to that Leonard Cohen at his most moody and mystical, given a similar treatment, and you have a complete package. Jungr invests the songs with an intensity that demands, and receives, attention. Jungr doesn't merely sing the songs, presenting cover versions of other people's work. These songs are given new arrangements and breathtaking interpretations. ….anybody in the Space Theatre seeing her for the first time would have been immediately aware that this was going to be something exceptional. Jungr sings with her entire body, from facial expression, vast amounts of body language, and right down to her finger tips. It is clear to see that these are the external signs of intense internal emotion and intellect at work. 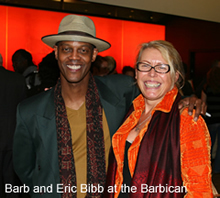 Barb Jungr came to our Cabaret Festival a decade ago, and on every visit she has reintroduced us to songs that we thought that we knew well, showing how much more there is to them. I think it is safe to say that Adelaide will be calling for her to come back time and again to thrill us with her insight and vast talent. She (Archer) and Barb Jungr were perfect role models for younger performers in cabaret singing; they both know how to look cheekily at an audience, how to find nuance and irony within lyrics, how to convey anything bawdy or lewd, when to employ the art of song-speak and how to hit someone between the eyes with song. 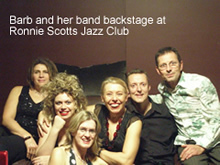 The stand-out performer in this tribute would have to be Barb Jungr. Her rendition of Surabaya Johnny was hilarious, not just because of the lyrics, but for her melodramatic, half-manic delivery.